“Ever since I heard of Williamstown, I knew it was a place of concentrated creativity where ambition is encouraged. I knew I wanted to be a part of it. I’m hungry and this place feeds”, said WKU Theatre senior Conner Keef. 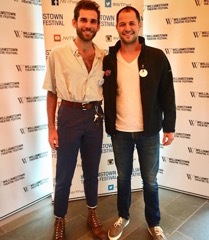 This summer Conner, along with WKU Theatre alum Tyler Brown, will fulfill his dream of working with Williamstown Theatre Festival in their Apprentice Program. Current college junior and seniors, as well as recent college graduates, from all over the country fight through WTF’s rigorous application process for a spot in the apprentice program. Their top applicants congregate to assist in making the Tony Award Winning summer seasons of Williamstown Theatre Festival possible. Apprentices are the lifeblood of WTF. The training provided through the WTF Apprentice Program fosters a unique hybrid curriculum, inspiring artists across disciplines. A bridge between educational and professional theatre, the WTF Apprentice Program is a hands-on, fully immersive introduction into the world of professional theatre. WKU senior Conner Keef of Maysville, KY, and WKU Alum Tyler Brown (’13) of Nashville, TN will gain hands-on, practical experience from professionals working on the WTF summer season. The world premiere comedy The Closet, along with Lempicka and The Sound Inside, are a few of the world class shows the apprentices will have the privilege of working on. Past apprentices have collaborated with artists such as Lewis Black, Elizabeth Banks, and Bradley Cooper. Connor and Tyler are in for a fantastic summer! WKU Theatre alum Becky Ann Baker said, “The Williamstown Theatre Festival is our country’s best summer festival! While there, Conner and Tyler will meet some of the finest directors, playwright, actors and designers that are currently working the theatre. They will have opportunities to take classes and work with all these professionals! It’s going to be quite a summer for them!” Congrats to Connor and Tyler!